This year’s record number of participants were split into two groups, with both groups getting to experience Japanese culture and gaining a solid introduction to the Japanese language. Nihongo classes were held each morning where campers were taught basic vocabulary, including counting and greetings, as well as helpful grammar tips. 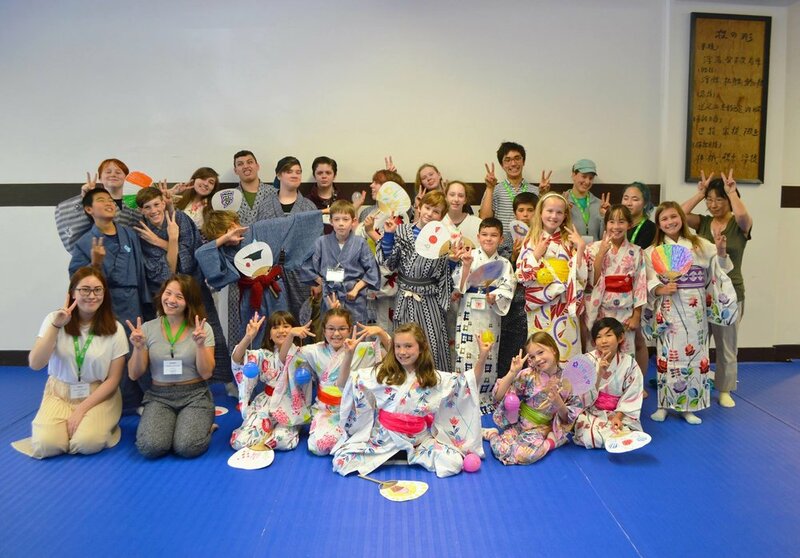 In the afternoon, campers went on to participate in cultural activities, such as calligraphy, karate, tea ceremony, and much more! As the summer intern in charge of taking pictures for the memory book this year, I was able to document many of the special moments of this year’s camp. Here are some of the highlights! Since memorization is key to learning the vocabulary in any language, campers were put to the test with games of karuta. Traditionally, karuta is a Japanese card game in which players slap the card being called to gain points. Here, campers Ryan, Rhyse, and Keton show their enthusiasm for this high energy game. One of the cultural activities was a demonstration of the Japanese tea ceremony with detailed narration. In the tea ceremony, campers were shown how guests should enter a tea house and how the host would make and serve the tea. Campers Emily and Emi in particular had the opportunity to experience the tea ceremony first hand as guest participants in the demonstration and really loved the unique custom. And of course, samples of tea sweets and green tea were served to all. A favorite activity among the campers was Bento making. Campers used creativity by making their own boxed lunches full of cutely shaped food to take home. Here are Arrie, Ella, Alex, Basho, Kenji, Maia, Sula, and Natalie showing off their finished creations with instructor, Lynn. Many campers recreated cartoon characters such as Pikachu or animals, like dogs, cats, and chickens. Finally, each group worked on a Chigiri-e piece throughout the camp as a community art project. Chigiri-e is made by using torn pieces of material to create a scene or image. The finished pieces were presented to their families during graduation on the last day and they turned out beautifully! With so many different activities throughout the week, each camper was able to find something to their liking. In fact, it was hard for the kids to choose which one they enjoyed the most at the end! Most importantly, campers were able to make good friends with each other and will hopefully keep in contact for years to come. Through my still growing passion for Japan, I personally am aspiring to become a translator in the future. Therefore, I am truly happy to see that so many of our campers were as enthusiastic to learn about Japanese language and culture as I was at their age and hope that they will continue their studies. Everyone at the JCCCW is thankful to all 24 campers and their families for joining us for the week and we hope to welcome them back again in the future!